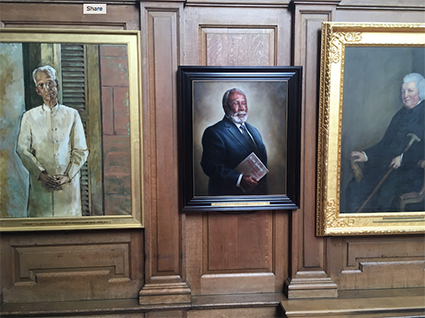 A portrait of UC Santa Cruz emeritus professor of philosophy William Abraham now hangs at Oxford University’s All Souls College between noted English judge William Blackstone (right), and Sir Sarvepalli Radharishnan, the former president of India (left). In 1959, UC Santa Cruz emeritus professor of philosophy William Abraham won a Prize Fellowship at Oxford University’s All Souls College—an award recognized by many as the ultimate post graduate achievement at the renowned institution. In doing so, the Ghanaian academic became the first African to receive this honor, and in fact remains the only African Prize Fellow to date. This summer, nearly 60 years later, Abraham returned to Oxford where he was honored with the unveiling of a commissioned portrait that now resides at All Souls College among other luminaries of the college. It hangs between Sir Radharishnan (the former president of India) and noted English judge William Blackstone. Born in Ghana in 1934, Abraham studied philosophy at the University of Ghana Legon, and then at Oxford, before returning to Ghana in 1962 at the request of Kwame Nkrumah, the president of Ghana. In 1966, Nkrumah was ousted in a military coup, and Abraham was imprisoned for nine months. He came to the United States in 1968 and eventually settled in California, joining the UC Santa Cruz faculty as a full philosophy professor in 1973. Abraham retired as a UC Santa Cruz emeritus professor of philosophy in 1994 and now lives in Saint Paul, Minnesota.